Over at Arms Control Wonk there is an intensely interesting post, dissecting the Chinese naval strategy for building missile-armed submarines (SSBNs) for nuclear deterrence against the US and Russia. Jeffrey Lewis, owner, ask the interesting question How Capable is the 094? 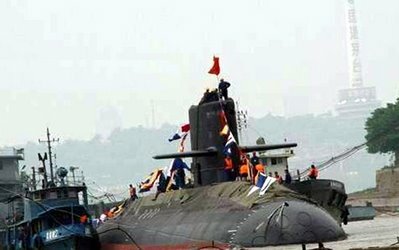 as a part of an ongoing series on the Chinese submarine programme. Analysing his way through open source information on the subs, he draws a number of very interesting conclusions about how those subs can actually operate, how their patrol patterns would be, what targets they are intended for and so on. But it gets really interesting when his thoughts are garnished by knowledgeable bloggers and geeks that contradict, support and all in all enlarges his thoughts. This is a brilliant example of grassroot, web 2.0 technology driven Open Source Intelligence (OSINT) - and I love it. Perhaps my knees gets wobbly over this sub dissection as I am myself nurture a nerdish complextion towards submarines and the strategic pictures they paint. I recently stubled over the ultimate naval strategy game package, consisting games such as Fleet Command, Sub Command and Dangerous Waters. These games are a million kilometres away from other computer games and they throw mud in the face of every decent 3D engineer who has toiled away to harness the fantastic powers of modern computers. They run in 3D, agreed, but you can tell how this is mostly an annoyance, a distraction from what the developers Sonalyst (and their nerdish constituency) really care about: Sensors. Instead of blazing around in 3D environments in a hectic tempo like any normal red-blooded computergame, you sit for hours in front of a 2D (albeit very realistic) depiction of a sonar waterfall. You check your various inputs, deploy towed arrays, drop sonarbuoys, listen, wait and listen some more. Even with time-acceleration it is ridiculous. Suddenly you get a confirmed contact and have those five minutes of nerve-riddled action. There is no way of smarting over that you enjoy games like these, but to anyone with the inclination, they prove a very addictive pass time.